Sandra Hutchison interviews Jenny Milchman, award-winning author of three traditionally-published thrillers and the originator of Take Your Child to a Bookstore Day, which falls on the first Saturday in December. Jenny, how did this special day come about? Take Your Child to a Bookstore Day began back in 2010 when I had two preschool-aged children I was taking to story hour at our local bookstore almost every week. I got both a latte and the chance to watch their faces as someone besides Mommy brought a story to life. What fun. In our increasingly frenetic and — ironically — disconnected world, I wondered: Did all children know the joy of time spent in a bookstore? Inspired by days such as Take Your Daughter to Work, I floated the idea for a special holiday linking kids and bookstores. Bloggers and listserv members took to the web and, before I knew it, 80 bookstores were celebrating just two weeks later, on the first Saturday of December. It coincides with holiday gift giving, encouraging booksellers to host story hours, author events, craft and cooking demonstrations, and even magic shows designed to give kids a special activity while their parents shop and browse. Local businesses gain increased support and families have a wonderful time. That first summer, my husband and I packed our kids into the car and drove cross country, visiting bookstores with Take Your Child to a Bookstore Day bookmarks and posters. We saw the United States one bookstore at a time. The trip offered us a window into different regions of this great land, while driving home the reality of how we are connected. Books connect us in a deeper way than texts or followers do. A smile is not the same as an emoticon, and the virtual world is not a replacement for the face-to-face. We met real friends, different from Facebook friends, in bookstores on the road. 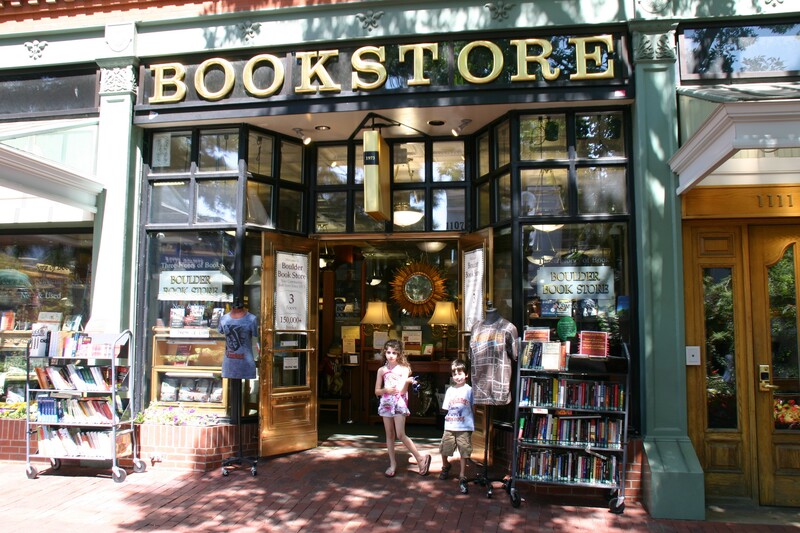 By the following year, Take Your Child to a Bookstore Day had grown to nearly 300 bookstores. And today TYCBD is celebrated by over 800 bookstores, including one national chain, on five continents. The celebrations are more lavish than ever — as unique as each bookstore in which they are held. Open Book in Wadena, MN, for example, is inviting a story-loving Great Pyrenees in so that the children can read to her! What can readers do to help get the word out? On December 5th, take your own children, a child in your life, or even the child inside yourself to a bookstore. I promise you will find a gift that keeps on giving long after the last page is turned. You’ve been networking with bookstores since before you even had a signed contract. Would you say that helped you on your way to traditional publication? Sadly, I don’t think bookstores have that power, at least not at this point — but let’s keep celebrating Take Your Child to a Bookstore Day! However, my love of bookstores certainly influenced my career once it was finally launched. In fact, during the thirteen years it took me to get published, the whole world changed, and self-publishing became a viable option. The reason I held out for the traditional path had a lot to do with how integral bookstores (and libraries) were to my dream of becoming an author. But supporting bookstores is a smart thing to do for any writer. The bookstore you frequent may one day stock your books. You may meet an author who helps you on your way. Your local bookstore might host a writers group that offers you feedback, a book club that features your book, or an event to celebrate your launch. The list goes on and on. You’ve been on “The World’s Longest Book Tour” for three successful novels now. What are your top tips for working effectively with local bookstores on author events? Understand the economics. Unless you routinely hit the NYT bestseller list, your event is likely to cost the bookstore more than it brings in. But that doesn’t mean they won’t want to hold one — bookstores are all about supporting their community. Offer to do a “value-add” event, one that will be more of a draw than a straight reading or signing. Hold a writers’ workshop for emerging authors; teach a class related to something in your book — anything from genealogy to a craft; serve drinks and treats to make it a party; pair with another author to bring in more of a crowd. Events should be a reciprocal effort: invite your own friends and contacts, seek out local media coverage, hang posters around town. Don’t blast social media — your Instagram buddies in Nebraska may not hop on a plane to reach your local bookstore in Tennessee. Instead, identify friends and followers who live near you and send personal messages or invitations. Consider hiring an independent publicity firm. I worked with JKS Communications and they had me in front of crowds of 300 when I was a brand new author. You’ve been remarkably open to working with indie (self-published) colleagues with your “Made It Moments” blog and author appearances. Bookstore folks aren’t always huge fans of the indie phenomenon, for understandable reasons. How do you handle that tension? Well, see above — many of the strategies I listed will help make you appealing to a bookseller whether you’re a traditionally published or indie author. But I think the key is to understand the situation from both sides. I’ve heard many an indie author say, “I’m giving them [the bookseller] something to sell! Why aren’t they appreciative?” Or words to that effect. And the truth is that until or unless you’re a bestselling author, your book likely costs the bookstore more than it will make off of it. Stocking charges, ordering — a bookseller at Bookstore Santa Cruz in California told me it takes 1/3 of a full-time work week for her employee simply to cut checks for indie authors. With traditionally published authors, the bookseller builds one order for a few key accounts and calls it a day. When pairing with indie authors for events, I am aware of these realities on the bookseller’s part, and I try to work with the author to help balance them. But the other thing is that I deeply respect the indie publishing movement. There are authors who might never have had their work read now walking this very tough road — pioneering it in many cases. Even if there is some inevitable tension, it’s worth it to get to be a part of these writers’ lives, and to try to blend the two different paths. At the end of the day, we all have a great deal in common. We want to share books that we love with others who might love them too. Do you have any recommendations for indies in particular in their relationship with bookstores? How about for people who are still hoping for that traditional contract? Hang in there. This road tends to take longer — sometimes much, much longer — but that disadvantage is offset by a relative ease of entry once you do break through. Collect reads of your work, educate yourself about the industry, make contacts through targeted writing conferences, follow authors, agents, and editors online, and know this one indisputable fact: The book is never as ready as we think it is, and it can always, always be made better. Tell us about a special time you had in a bookstore as a child. I remember finding “Kramer Vs. Kramer” in my local bookstore — one of four my hometown had at that time. (It now has two). I wanted to read that novel more than anything. My parents weren’t getting divorced — in fact, they’ve now been married 53 years — but this was the early 80’s, and many families were going through the social upheaval of women returning to the work force and demanding more marital balance. I really related to Daddy Kramer’s struggles, and how they impacted his son. Anyway, we couldn’t afford new books for the most part when I was a child, so I trudged to that bookstore day after day, until I had finally gulped down the whole, satisfying story. The bookseller never chastised me for reading for free. On the final day, when I was just about to finish, one of my parents showed up. I can’t even remember whether it was my mom or my dad. Whoever it was bought the book, which I read about twenty times after that. After a thirteen year journey/trek/slog toward publication, Jenny’s debut novel, “Cover of Snow,” was acquired by Random House. It won the Mary Higgins Clark award, was praised by the New York Times, and chosen as an Indie Next and Target Pick. “Ruin Falls” was published the next year, and chosen as an Indie Next Pick and a Top Ten of 2014 by Suspense Magazine. Jenny’s third novel, “As Night Falls,” was published in June, 2015. The most dangerous secret is the one you keep from yourself. When two escaped convicts show up at Sandy Tremont’s mountaintop home at the start of the season’s first snow storm, they unleash the most harrowing night of Sandy’s life—and a past she has kept from her family.